Winner of the 2013 Cecil Drew Oratorio Prize and the 2013 Vocal Competition at The International Eisteddfod 2013, Iúnó is currently in her final year at the Birmingham Conservatoire of Music, where she studies with Catherine Benson. Before taking up a place to study at the Conservatoire Iúnó lived and worked in London, experiencing the classical music world working for Artist Management Agency HarrisonParrott. Whilst in London she studied privately with Soprano Yvette Bonner and sung with the London Choral Society and The Holst Singers. Iúnó has recorded solo vocals for TV productions including the BBC’s Desperate Romantics, and performing on Granada Televisions My Favourite Hymns whilst still at school. From September to December 2012, Iuno took a placement at the Conservatorio “G. Frescobaldi” in Ferrara, Italy, where she studied with Soprano Cinzia Forte and Baritone Paolo Coni, working primarily on the Italian language and Bel Canto repertoire. Whilst in Italy she performed in the Ridotto del Teatro Comunale di Ferrara, and also with Italian Festival “In Chorde” (Freon Musica), which led to various performances in the Emilia-Romagna region. In England recent performances have included Soprano Soloist for Bach’s B Minor Mass conducted by Paul Spicer in the Adrian Boult Hall, Soloist for Shaftesbury Arts Festival, and solo recitals including a performance at St. Chad’s in Shrewsbury as part of the “Concerts in the Round” series. In Opera, she has sung with British Youth Opera in their Summer Opera course, has sung the role of Adele from Strauss’s Die Fledermaus (scenes), Graduate (Street Scene) and has performed with Winterbourne Opera. In the Summer of 2012, she was a finalist in the televised final of the International Eisteddfod Llangollen. 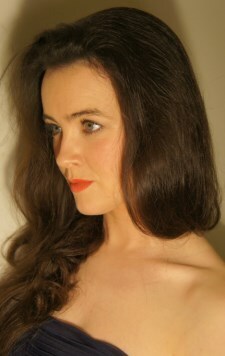 In 2013 Iúnó has performed in the Auditorium of the Theatre Severn in a Proms Concert to support The West Shrewsbury Hospice; at the Teatro Comunale di Ferrara with Festival “In Chorde“; in London duo-recitals at St Mary-at-Hill with soprano Sophie Pullen and Pianist Yoko Misumi, with whom she has also performed in a fundraising concert supporting the Neal Turkington Nepal Project at the In & Out Club, St James’s Square. She has also collaborated with guitar duo Daniel Bovey & Julian Vickers in a concert for classical song repertoire ranging from Britten to Rodrigo and De Falla. Future performances this winter 2013 include soprano soloist in Rossini’s Stabat Mater, Oxford; the title role in “Ninja” by Viennese composer Ulf-Diether Soyka; Fiordiligi (Cosi fan tutte) in a production of opera scenes; Lia in Debussy’s “L’enfant prodigue” and in concert as part of the Beyond Classical concert series at Symphony Hall Birmingham. In march 2014, Iúnó will sing the role of Blanche de la Force in Poulenc’s “Dialogues des Carmelites” (6th & 8th March, Crescent Theatre, Birmingham). Find out more about Iúnó here.